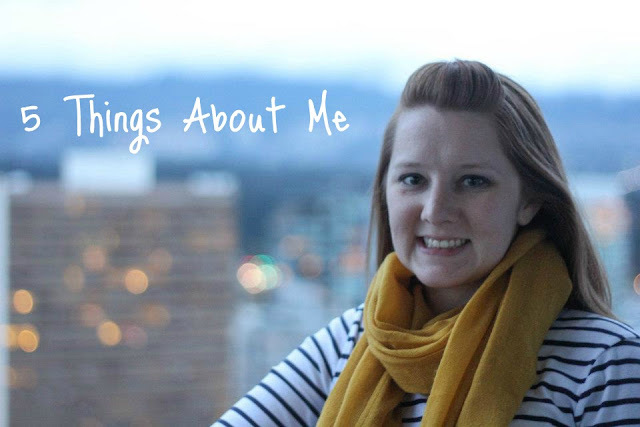 I've been seeing quite a few people share 5 things about themselves, I wanted to do the same. Here it goes! 1. I really don't share a lot of information about myself. I usually stay pretty surface level with the amount of personal information that I put out there. I'm afraid that people might think I'm weird or something :). But, I thought this "5 things about me" exercise would be good to help me step out of my comfort zone a little bit. 4. I want to travel the world & take Luke right along with me! The only foreign counties that I been to are Canada & Mexico though. Luke & I have huge dreams of visiting many places in Europe but it never seems like we can afford it. It won't stop us from saving up & making it over there one day though! 5. I love food & cooking is another one of my passions (right behind photography... maybe that's why I love photographing food so much!). I try to cook dinner for Luke & I almost every day of the week. I'm always trying out new recipes & perfecting old favorites. Cooking is my favorite way to unwind after a long day at the office, or relaxing on the weekends. There is nothing more satisfying than a delicious home-cooked meal. I'm right there with you on number 3 and 5! I don't want kids right now either and often wonder if that feeling will go away. Teaching probably makes me that feeling stronger since I deal with ridiculous kids every day, so maybe once I'm done with all of that I'll finally want them! Cooking is my every day wind down and it is my chance to catch up with Andrew because we usually cook together. Your photography IS amazing and you SHOULD go for it! I'll definitely second your friends on that front! You need to take your camera on a walkabout in wine country now that the weather is clearing up! Oh Miss Holls.... we are so similar! Photography, traveling and selfishly loving my life just hubs & wife. We are two peas!